Here’s Lena! – a versatile all-season pullover, super terrific wardrobe addition, AND very fun knit! Lena’s fit is slim and shapely, extending high hip in length. Her neckline is a wide shallow scoop that enhances the drama of her raglan three-quarter sleeves, all trimmed up in a 1x1 rib. 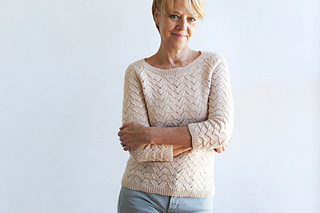 Double Wing lace is Lena’s overall texture – an easily memorized 16 stitch by 10 row repeat. Its reverse stockinette, re-employed at the edges, allows (minimal) seaming to be worked comfortably and oh so invisibly! Lena is worked bottom-up on circular needles until the underarm and start of raglan shaping where the bodice splits and each side is worked separately. The neckline trim is continued from stitches held with just a bit of pick up along each side front. Shown in Chickadee wool by Quince & Co. (100% wool; 181 yds per 50g skein); color – Petal #111; 6, 7, 8, 9, 10, 11, 12 skeins, or for comparable yarn, approximately 1100, 1270, 1420, 1620, 1780, 1995, 2175 yards. I always buy extra. 12 page pdf includes pattern instructions, photographs, schematics, relevant abbreviations, lace description and chart, lace shaping notes, a row tracking grid for managing at-the-same-time instructions, and a multi-set lace chart template to assist tracking of lace stitch sequences during shaping.